Most people consider the turkey the star of the Thanksgiving meal. I say that there is room at the table for one more contender- the honey glazed ham. I love to eat it with all the Thanksgiving fixings and the leftovers are great for breakfast the next morning. This homemade glaze is simply delicious and requires few ingredients. The key is to cook the ham in a low oven so it stays moist and the sugar doesn't burn. Try this honey glazed ham this Thanksgiving. Combine honey, vinegar, cloves, sugar, and cinnamon until well combined. Cook over low heat until sauce almost reaches the boiling point. Remove from heat. Slice ham halfway through into desired thickness for servings. Tie with string and place in a roasting pan. Pour sauce over ham, cover and marinate in the refrigerator for 24 hours. 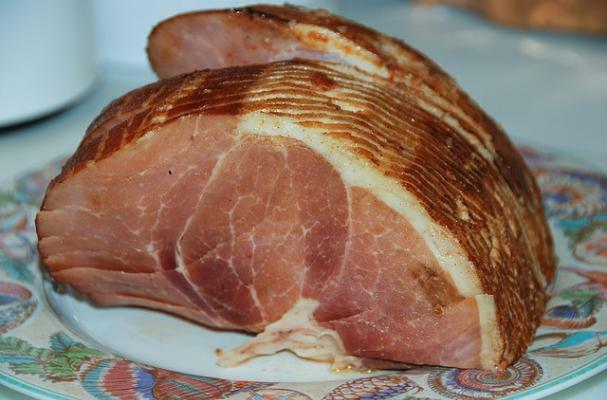 Two hours prior to baking, remove ham from refrigerator and bring to room temperature. Bake at 275*F for about 1 hour, basting occasionally, to heat through. Glaze top under broiler if desired. Carefully monitor while under broiler so as not to burn.